I keep reading about Macarons. These are sometimes referred to as Macaroons, (although technically they are a different cookie made from coconut), Parisian Macarons and French Macarons. I'm talking about those crispy, pastel, sweet treats with the soft centre that look so delicate and pretty. According to Wikipedia, Macarons are sandwich-like pastries made with two thin cookies and a cream or ganache between the cookies. They are a traditional French pastry from Nancy and are said to date back to the 18th Century. Macarons are popping up all over the place. They were featured heavily in Sofia Coppola's influential movie Marie Antoinette in 2006, and I have seen them on many blogs recently including (Inside A Black Apple), Babyccino, Syrup & Tang (with a great review of macarons in Sydney and Melbourne), ColourLovers, David Lebovitz, Fashion Week Daily, and Serious Eats, to name just a few. 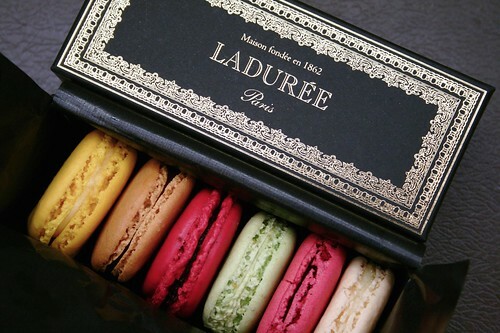 Two much-revered brands are Pierre Hermé and Ladurée, both based in Paris. 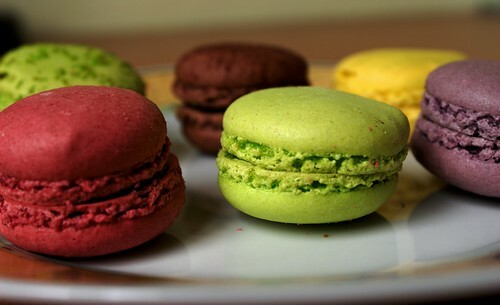 For more detailed information about macarons, there is a great post by Chocolate & Zucchini. And if you just can't get enough of macarons, check out images on Flickr. I'm so jealous! Great to have you stop by Jade. I'm going to have to write some more food-related posts for you! Is there a way to get my hands on some of these without pulling out my passport? I would love to have some of these for my wedding!